The 10 points were published in Dyslexia Contact, September 2013. See below for full details and samples in HTML, and also Word and PDF versions, and an Excel file of trials with the various voices. Writing for Text to Speech. Jean Hutchins, B.D.A. New Technologies Committee. Here are ten important points about writing for Text to Speech (TTS) software and audio files. Most are included in the B.D.A. Dyslexia Style Guide. The speech engines are improving, but still say some odd things. We cannot avoid some ‘funnies’, so we should do everything possible to amend ones that we can express more suitably. Please listen to what you write, and remember that the voices vary in their pronunciation. Use Styles for headings and sub-headings, to create bookmarks for PDF files and Navigation Pane for Word, for navigation purposes. Use more punctuation. If a human reader would pause and let his or her voice drop, we need to indicate this in text. For clock times, 12.45 would sound like a decimal, so put a colon, as in 12:45. Use manual numbers in lists. TTS does not speak automated numbering in Word. Put page numbers, manually, at the top of each page. Dyslexic listeners need to hear them, for navigation in the file and in the printed copy. Put stops in capital letter vowel initialisms that we say by letter-name, if you do not want them spoken as words, e.g. not HE, NUT, OBE, but H.E., N.U.T. and O.B.E. Put hyphens in compound words, e.g. help-liners, mind-map, stake-holder. Use roman numerals, which TTS logically says as words. Insert footnotes, which are hard to navigate, and break up the continuity of the speaking. Put Vol., No., mins, pt, when you mean Volume, Number, minutes, point. A full account of these points, and further ones, with reasons and samples for you to try with your Text to Speech, are available in Word, PDF and below in an HTML version. 7. Amendments for Audio files. Ivona MiniReader and Acrobat Reader default voices Microsoft Anna. Most of the ‘funnies’ come from B.D.A. publications. Organisations such as R.N.I.B., Call Scotland, and Load2Learn give advice about setting out visual presentation of documents for easier reading by dyslexic readers. PDF files to preserve the display in printed versions, and very adaptable Word files for setting one’s own preferences. Styles in Word for Headings for Word Navigation Pane or Document Map, for Bookmarks in PDF files, and other Styles for consistency. Bookmarks for internal links in Word, which will also operate in PDF files. Thick, matt, cream or pastel paper for printing. Sans serif font, 12 to 14 point, dark colour on light background. Bold for headings or emphasis, but not italics, underlining or capitals. Left justified, line length 60 to 70 character, line-spacing of at least 1.5, letter-spacing, try 0.1 point or more. Bullet points and manual numbering to break up text, (see automated numbering), borders but not text boxes (see samples). Short, simple sentences, active not passive verbs, concise text and short paragraphs. Visual reading and TTS are time-consuming and exhausting for dyslexic users. There is very little information about writing documents so that they sound sensible with TTS (Text to Speech). Text2Go provision for audio files gives some pointers about pauses, vocalising hyphens in number ranges and removing references, all of which are included in this document. The only way to identify the funnies is to listen, which is very time-consuming. And, listen without following in the text! Can you hear every word? However, do not assume that what your software says is what everyone else hears. Each family of voices say different ‘funnies’ and vary in different applications and platforms. For example, speech within Kurzweil 3000 is slightly different from an audio file made using the same Julie voice. Serena says different funnies in ClaroRead and SaySo. The voices may pronounce words differently in context and singly. The file of the best possible source document will sound good in anyone’s computer or device, in any application, in any platform, and will need fewer amendments for other formats, such as audio files. The easiest improvement is punctuation. If a human reader would pause and let his or her voice drop, we need to indicate this in text. 1.1. Titles and sub headings. Some TTS will pause at hard return line ends, but not all. So always put stops. 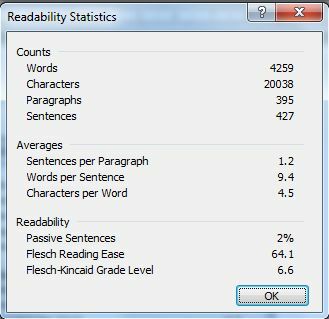 (Moreover, stops will appear to improve reading level calculations, because they show shorter sentences.) One dyslexic adult has said that stops in headings give her visual stress. An ingenious solution was very pale coloured stops which were invisible. These have to be formatted manually, and would show if the reader used a tinted background colour. Some TTS can speak the Document Map in Office XP and Navigation Pane in Office 2007 and 2010 and the Styles in Word and the Bookmarks in PDFs. As mentioned for visual presentation, they are produced in Word by formatting headings and sub-headings with Styles. Use stops or semi-colons after each bullet point. It is quite grammatically suitable to put them, but writers often do not bother with them. Otherwise, TTS may rattle through them at a gabble (and they too will be considered as very long sentences for reading levels.) Even where it seems ungrammatical, stops are best for TTS that high-lights one sentence at a time. A very long list of bullet points, without stops, appears to be just one sentence, which would be unhelpful for eye tracking. TTS may vocalise bullet points, especially fancy ones. SaySo even says the basic ones. It is odd to hear an ordinary bullet say ‘middle dot’. An empty circle may say ‘oh’. An arrow may say something indecipherable. A square dot may say ‘section’. Notice where you pause when reading aloud and put relevant punctuation. Notice where you pause, when reading aloud, and put relevant punctuation. Some TTS vocalises ‘smart single quotes’, or ‘curly quotes’, so please use ‘straight single quotes’, (for apostrophes too) and therefore “straight double quotes” for consistency”. A real funny happens if a single quote ends with a number, TTS may say ‘feet’, and a double quote after a number might say ‘inches’. That happened in an audio file but not directly in the software with the same voice. B.D.A. celebrated its fortieth year with a ’40 by 40′ list of tips. B.D.A. celebrated its fortieth year with a “40 by 40” list of tips. Rules vary for use of hy-phens, en dash, – , and em dash, — , with and without spaces. When they are between words, TTS usually ignores them suitably. An em dash may insert a half second pause, but don’t rely on it. If you want a pause, it is probably better to put a comma or colon or a stop. Dashes in number ranges are discussed in the Numbers section. Would you say ‘slash’ when you were reading aloud? It sounds even worse if the slash is ignored. dyslexia/dyspraxia, (even with spaces dyslexia / dyspraxia). S/he is not spoken sensibly. However, TTS usually says ‘and/or’ suitably as ‘and or’. Apart from ‘and/or’, do not use slashes with words. See Dates for slashes with numbers. Leader lines in contents list etc. are good visually for drawing one’s eye across the page to the relevant number. However, TTS sometimes verbalises them as ‘horizontal ellipsis’, ‘dash’ or ‘underscore’ repeated many, many times, in a PDF, even if not in the source Word file. Avoid leaders in contents lists, by putting the page numbers first (remembering stops for pauses). We say millions, thousands and hundreds and so does most TTS. However, we say, e.g. Charity Numbers and ISBNs as single digits. TTS does not. We cannot do anything about that. Population 1,234,567 and Registered Charity Number 1234567890. We say 123.456 as whole number, point, single digits. All TTS does that. We say them as single digits, starting with Oh or Zero, sometimes saying e.g. double six. All TTS says the area code as digits, but there is no version of the ending that all TTS say suitably. Tel: 01234 566 789 suits more TTS, and looks the best visually for reading in chunks. Some TTS say Telephone in full. TTS does well with money. and €123.45 as euros and cents. Logically, TTS says 12.45 as a decimal. Put a colon and write 12:45 to hear twelve forty-five. Some TTS says ‘am’ as a word. 12:45a.m., or 12:45 a.m. suit more TTS. Most voices say First, Second, Third, Fourth, (1st, 2nd, 3rd, 4th) etc. automatically for the day numbers. So you do not need to put ‘st, nd, rd, th’, which is an odd convention anyway. US TTS is likely to say the month first in numbered dates. UK voices may say numbered dates as digits. TTS says years recognisably, tho one says 1945 oddly. TTS says 2013 well, but one says 1945 oddly. UK voices say 10/04/2013 as digits or as tenth April 2013. US voices say 10/04/2013 as October fourth! So please put the month as a word, e.g. 10 April 2013. Some TTS says 2011/12 as December 2011, or as digits, or say slash, or even think it is a division sum and say 2011 over 12. Access to apprenticeships fell to 8.2 per cent in 2011/12. If you mean ‘2011 and 2012′, please write it. We do not want any vocalisation for hyphens, en dashes or em dashes between words, and TTS complies. However, in number ranges, the dash means ‘to’ so please write it. House styles vary about which dash to use, and whether to have spaces on either side. TTS may say ‘to’ suitably, but is more likely to pause, or say ‘dash’, or ‘minus’ or even ‘5 the 10th July’, or even ‘May 10 July’. In dates, 5-10 July means 5 to 10 July. In ages, 5–10 years means 5 to 10 years. In times, 5—10pm means 5 to 10pm. In references, pp 5–10 means pp 5 to 10. In years, 1923—2008, means 1923 to 2008. An obituary notice 1923 — 2008 really did say 1923 minus 2008! We say 1:1 as one to one, so please write it. TTS says variously to, colon or ignores the sign. Logically, TTS says most of them as words or letter-names, particularly if they are in lower case. So do not write roman numerals. Capital letters of roman numerals are better. Charles I, Elizabeth II, Richard III, George IV, Edward V, George VI, Edward VII, Edward VIII, Louis IX, Louis X.
VI may be spoken as letter names meaning Visually Impaired or Vi as for the name Violet or as 6, not necessarily correctly for the contexts. Nearly all TTS will say plus for + and divided by for ÷, but understandably does not say minus for – which is usually ignored, (but might for an en dash) or times for x, which is said as the letter name. We cannot do anything about this. 6+4=10 and 24÷6=4 are usually said better than 10-6=4 and 6×4=24. Some TTS do not say automated numbers, so please use manual number lists. Dyslexic visual readers and listeners all like numbers for reference and navigation. We need stops after numbers to make the voices pause. Visual readers may want to increase the font size or the spacing, which changes the pagination. So we should show the original page numbers manually, at the top of the page, for reference to the contents list and the printed copy. 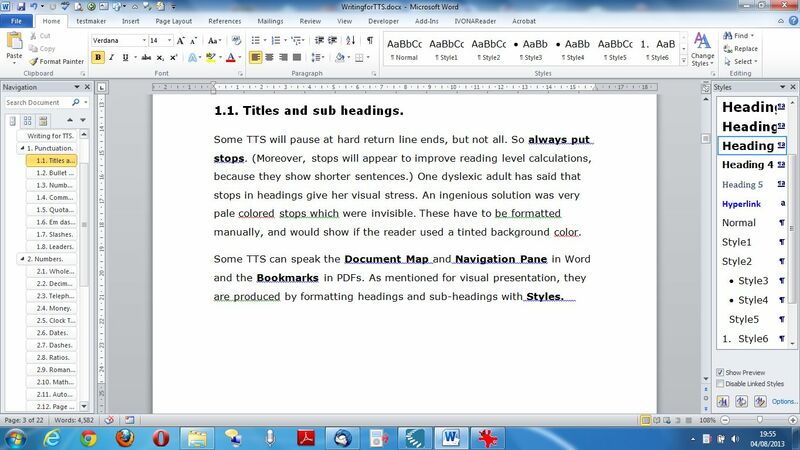 TTS does not speak page numbers and other text in headers or footers in Word. It usually says them in derived PDF files, but not necessarily in a suitable reading order. For audio files it is essential to have page numbers spoken at the top of the page, for anyone wanting to refer to the printed copy. Load2Learn advocates putting [p7] manually as reference to the printed version. SaySo says that as ‘page’, but the other TTS just say the letter-name, so it is better to put [page 7.]. It is disconcerting when TTS says page numbers in the middle of a sentence split between one page and the next, (sometimes even in the middle of a hyphenated word!) but we cannot help that. Do not use footnotes. TTS does not speak the footnote text that appears in a little window when you hover over the number. Dyslexic readers, who scroll to the bottom of the page to hear the footnote, may not be able to find the place in the page again. Footnote text, at the bottom of a page, is usually in very small font-size, particularly the footnote number, which has a link back to the context. TTS ignores footnotes and carries on to the next page. If you click on a footnote, TTS speaks all the footnotes in the documents continuously. If the footnote item is a number, all TTS will include the footnote number, e.g. will say 2013 as twenty thousand one hundred and thirty-one. Text-boxes are advocated for breaking up dense blocks of text, and are spoken well in PDF files. TTS ignores textboxes in continuous reading in Word. Users have to click on each box in turn to hear it. Please use borders instead of text-boxes. In Word, continuous reading will include text in borders. It may be easier if you type plain text, insert the border and then format your text with bullet points etc. Try the textbox and borders samples in the Word and PDF files. RNIB and Load2Learn say that empty lines are difficult for screen readers for visually impaired people. So please use styles to control line spacing, and insert page breaks. 3.3. No interruptions in articles. Could anything be worse for listening than a page of advertisements in the middle of a multi-page article? Yes, a page of adverts in the middle of a sentence, or even in the middle of a hyphenated word! Some type-faces have letters so close together that scanners may convert them, or TTS may speak them, as if joined, e.g. cl as d, fi as fl, rn as m, as in ‘modern’ interpreted as ‘modem’. Even minimal expanded letter spacing of .1 point may help this situation. Research suggests that expanded line spacing may help children with reading. Try this version using .1 expanded letter spacing. Some type-faces have letters so close together that scanners may convert them, or TTS may speak them as if joined, e.g. cl as d, fi as fl, rn as m, as in ‘modern’ interpreted as ‘modem’. Even minimal expanded letter spacing of .1 point may help this situation. Research suggests that expanded line spacing may help children with reading. 4.1. Capital letter initialisms and acronyms. BDA or B.D.A.? This is perhaps the most controversial item in writing for TTS. It is conventional for British publishers not to put stops. Stops are more common in American house styles. All TTS says BDA as letter names, but it is a good idea, as a principle, to put B.D.A. with stops, as a reminder of all the recommendations in this document! Stops in headings and in initialisms cause visual stress to one dyslexic reader. One dyslexic adult says stops widen sets of initials so that he takes in fewer words in each eye movement. We sympathise with them, but B.D.A. Chief Executive ruled that we should give priority to dyslexic people who are dependent on Text to Speech by making initialisms sound right for them. House styles recommend consistency, i.e. stops in all initialisms or none. Stops are unnecessary in consonant initialisms, e.g. BBC, BT and PhD, which TTS says suitably as letter-names. However, TTS will say initialisms with vowels as words. We want to hear acronyms like SENCo and AMBDA as words, but not initialisms such as NUT, HE, OBE, and many more. Put stops in vowel initialisms that we do not say as words. Writing convention says that one should give the full term in the first instance of an initialism, and that letters are acceptable thereafter. However, dyslexia readers may not be able to remember what they mean, nor be able to find the full term again, nor return to the reading place. They have similar difficulties with a glossary. Listeners to audio files cannot jump about anyway. So it is really better to use the full terms all the time. Try these with your TTS. ADD means Attention Deficit Disorder, so try A.D.D. ADHD means Attention Deficit with Hyperactivity Disorder, so try A.D.H.D. AT means Assistive Technology, so try A.T.
BA means Bachelor of Arts, so try B.A. BDA is spoken correctly by TTS, but as a matter of principle, try B.D.A. CEO means Chief Executive Officer, so try C.E.O. DfE means Department for Education, so try D.f.E. EAL means English as an additional language, so try E.A.L. FE means Further Education, so try F.E. HE means Higher Education so try H.E. HEI means Higher Education Institute, so try H.E.I. ICT means Information and Communication Technology, so try I.C.T. IT means Information Technology, so try I.T. ITT means Initial teacher training, so try I.T.T. LA may mean Local Authority but also means Los Angeles. NUT means National Union of Teachers, so try N.U.T. OBE means Order of the British Empire, so try O.B.E. OM means Organisational Member. O.M. is ok but O.M.s is a problem. OT means Occupational Therapist, so try O.T. PE means Physical Education, so try P.E. RNIB means Royal National Institute for the Blind, so try R.N.I.B. RNID means Royal National Institute for the Deaf, so try R.N.I.D. SEN means Special Educational Needs, so try S.E.N. VI means Visually Impaired or 6. (see Numbers, Roman numerals). SENCo meaning Special Education Needs Co-ordinator. TTS says the full terms of a few consonant initialisms but not necessarily a relevant meaning for the context, e.g. HR as hours instead of Human Resources, so try H.R. MS Word and MS Anna as millisecond or manuscript or mizz as in Ms, or Mississippi, instead of Microsoft, so try M.S. A and a are usually indefinite articles, which we, and TTS, say suitably as a schwa ə, or ‘uh’. So TTS cannot cope in other contexts. a. or a) in a lettered list. Not all TTS knows that No. means Number, Vol. means Volume. mins means minutes not minimums, or that pt, as in Arial 12pt, means point, not pint, platinum, part or letter names. Most TTS says eg and eg. as ‘egg’. It says e.g. suitably as letter-names or ‘for example’, though Tina in Read & Write surprisingly still says ‘egg’. TTS sometimes say ie as ‘ee’, sometimes suitably as ‘eye ee’. It says i.e. suitably as letter-names or ‘that is’, though Tina surprisingly still says ‘ee’. When we abbreviate names of days and months, most TTS will say the full words in context. However, it was strange to hear ‘January’ in “Well done Jan.” And Sunday in “The article was in the Sun”. Oddly, TTS says days with stops as 3-letter words, and months with stops have too long a pause. So both are better without stops. The event will be on Sun 1 Jan 2014 or Sun. 1 Jan. 2014. The event will be on Mon 1 Feb 2014 or Mon. 1 Feb. 2014. The event will be on Tues 1 Mar 2014 or Tues. 1 Mar. 2014. The event will be on Wed 1 Apr 2014 or Wed. 1 Apr. 2014. The event will be on Thurs 1 May 2014 or Thurs. 1 May 2014. The event will be on Fri 1 Jun 2014 or Fri. 1 Jun. 2014. The event will be on Sat 1 Jul 2014 or Sat. 1 Jul. 2014. The event will be on 1 Aug 2014 or 1 Aug. 2014. The event will be on 1 Sep 2014 or 1 Sep. 2014. The event will be on 1 Oct 2014 or 1 Oct. 2014. The event will be on 1 Nov 2014 or 1 Nov. 2014. The event will be on 1 Dec 2014 or 1 Dec. 2014. TTS understandably has problems with Dr and Dr. meaning Doctor and Drive, and with St and St. meaning Saint and Street. Dr Scott lives in Oxford Dr and St David’s College is in Oxford St, London. Dr. Scott lives in Oxford Dr. and St. David’s College is in Oxford St. Put hyphens in compound words, because TTS does not always know where to split them. Hyphenated words are easier for visual readers too. Broadband sounds better as broad-band. Database sounds better as data-base. Downloaded sounds better as down-loaded. Email is ok, but ebooks sounds better as e-books. Freeware sounds better as free-ware. Fundraising sounds better as fund-raising. Hardware sounds better as hard-ware. Helpliners sounds better as help-liners. Mindmap sounds better as mind-map. Neurodiverse sounds better as neuro-diverse. Notepad sounds better as note-pad. Notetaker sounds better as note-taker. Placeholder sounds better as place-holder. Salesforce sounds better as sales-force. Screenshot sounds better as screen-shot. Signup sounds better as sign-up. Slideshow sounds better as slide-show. Spokesperson sounds better as spokes-person. Stakeholder sounds better as stake-holder. Textreaders sounds better as text-readers. Toolbar sounds better as tool-bar. Touchpad sounds better as touch-pad. Webcam sounds better as web-cam. Webpages sounds better as web-pages. Wildlife sounds better as wild-life. Wordpad sounds better as word-pad. TTS makes mistakes with words with two pronunciations for different meanings. Some are related nouns and verbs with stress on different syllables. Some have totally unrelated meanings. TTS does remarkably well with these homographs, according to context, but not always. Robin Hood had a bow and some arrows. David tied a bow in his trainers. You must bow to the Queen. The guests enjoyed the buffet at the reception. I saw the wind buffet the trees. I had the dog on the lead. The flag-bearer will lead the procession. The thieves stole the lead from the church roof. The boy learned his spellings for the test. The professor was a very learned man. The B.D.A. International Conference is at G Live, Guildford. The dyslexic sculptor makes minute images. The boy went for a ride on his moped. The dog moped when the family went on holiday. I saw a valuable object on the Antiques Road-show. Does your aunt object to watching tennis matches. Will the Queen present the prizes? Is there a quorum of members present? A tennis racquet was my best birthday present. Can he produce his M.O.T. certificate? He sold the farm produce in the market. They worked together on their homework project. I hope we can project the image on the screen. How long will it take you to read the book? When I was on holiday, I read four books. B.D.A. used to have an office in Reading, Berkshire. The Oxford Reading Tree is a school scheme. Please record the television programme for later viewing. Do tell me, off the record. Did Mary refuse to help? Take the refuse out to the bins. Our seats were in the front row in the theatre. The sailors will row the boat across the lake. The man stormed out after a big row. John was nominated and seconded for the post. The staff member was seconded to the charity for a year. The film was so sad, the girl was in tears. The shredding machine tears up all the papers. You can wind a watch or wind up a speech. TTS does say the majority of words suitably but there are words that TTS does not get right yet. not realise that the voice is doing a ‘funny’. Some voices do not say the following emboldened words correctly. Many web addresses sound very strange. Bi-weekly can mean every two weeks, or twice a week. Technology tools can be used to develop compensatory strategies. Please contact the Admissions Coordinator. Many students become frustrated and demotivated. Before they move in, they will make good the dilapidations. Verbal expression may be disorganised and not succinct. This book is very accessible but not dumbed-down. 100 Ideas for Supporting Pupils with Dyspraxia. The Kindle e-ink is good for reading in sunlight. The reports have emphasised the importance of training staff well. David emphasises the need for resilience. The student would benefit from more time in exams. This person will have some expertise and experience. A new digital pen vibrates to indicate bad spelling and grammar. Sometimes the TTS version of a word is indecipherable. These comparisons provide irrefutable evidence. Suits had wide lapels and trousers were flared. Dyslexic people tend to be lateral thinkers. We have full public liability and professional indemnity insurance. All pages have the B.D.A. logo. A further 6% have milder dyslexic difficulties. We manage our monies very carefully. You are committing a criminal offence. We have had visiting lectures from an orthoptist. The student is penalised for every mistake by deduction in marks. The Phonics Screening Check was introduced. Phonological skills were generally normal throughout. Be proactive in making requests for alternative formats. Avoid digital print processing which tends to leave paper shiny. Roger Federer is using a new type of tennis racquet. Words with the prefix ‘re’: reprogram, rereleased, resell and revisit. They have smallish screens, smaller than normal keyboards. All students are encouraged to invent and share learning strategies. Each student had found a method of support which suited them best. Parents will have the same rights to bring cases to tribunals. They will ensure its financial viability. Consider whether there are any viable alternatives. It is strange to hear TTS vocalise bullet points. Some purchasable TTS programs, e.g. Read & Write, ClaroRead and Kurzweil 3000, but not SaySo yet, have facilities for amending pronunciation of items that cannot be presented visibly more suitably. They will apply for all instances and for all files, but only in that particular computer, and only for individual voice families. For example, Kurzweil 3000 amendments for Paul only apply to the Paul and Julie voices. School staff and adult support workers may know how to use the facility and what to put, but many dyslexia listeners will not be able to amend pronunciation for their own use. The technical process is quite easy. In ClaroRead, type, or copy and paste, the item into Settings/Pronounce. Then in all cases, enter the new version, test, and save when satisfied. BA12 7PL (says bar and place, so amend as B A 12. 7 P L). DY1 4AZ (says die and as, so amend as D Y 1. 4 A Z.). GU10 3AP (says goo and app, so amend as G U 10. 3 A P.). LL30 1RD (says road or oddly as first, so amend as 1 R D.). LN6 8ED (says Ed so amend as E D.). SO51 0ZS(says so, so amend as S O). SW6 6EG (says south west and egg, so amend as S W 6 6 E G). And many web addresses, e.g. www.bdadyslexia.org.uk as w w w b d ay dyslexia dot org dot uk. It is particularly useful to put ‘ay’ when ‘A’ should say the letter-name not ‘uh’, e.g. in A Level. Most of the amendments apply in synthesised audio files made with those voices. We cannot amend the heteronyms. They may need the other pronunciation in another place in a document. Speech engines are getting better with such words in context, but are not good enough yet. So you need a copy of the text that no one will ever see. Then you can write ‘live’ as ‘liv’ or ‘lyve’, ‘read’ as ‘reed’ or ‘red’, according to the pronunciation that is needed, so that the audio file says it correctly. Use Styles for headings and sub-headings, to create bookmarks for pdfs and Navigation Pane for Word. Use more punctuation, to make the voice pause and drop in tone. Put stops after headings and sub-headings. Use stops or semi-colons after each bullet point. Put stops after numbers in lists. Use straight quotation marks and apostrophes. Tel: 01234 566 789 suits more TTS. For clock times, 12.45 would sound like a decimal, so put a colon, as in 12:45. Write a.m. for afternoon. In dates, put the month as a word, e.g. 10 April 2013. If you say ‘to’ in a number range, e.g. 7-11, please write it. Use Manual number lists, with stops. TTS does not speak automated numbering in Word. Put page numbers, manually, at the top of each page. Dyslexic listeners need to hear them, for navigation in the file and in the printed copy, e.g. [page 7.]. Use borders, and try expanded letter spacing. Put stops in capital letter vowel initialisms that we say by letter-name, if you do not want them spoken as words, e.g. not HE, NUT, OBE but H.E., N.U.T. and O.B.E. Put stops in e.g., and i.e. Put names of days and months in full. Put hyphens in compound words. Use dashes if you would say ‘to’, e.g. 7-11 years. Insert slashes. Do you say ‘dyslexia/dyspraxia’ as ‘dyslexia slash dyspraxia’? Put leaders in tabulated lists or horizontal ellipses in text or colons in ratios. Insert footnotes, which are hard to navigate and break up the continuity of the speaking. Insert text boxes because you have to click on each one to hear it. Have empty lines, which confuse visually impaired listeners. Allow interruptions to the continuity of the text (e.g. adverts in mid article). Words and abbreviations with two pronunciations. Some words that TTS does not get right yet. Items not in dictionaries: postcodes, web addresses, many proper names. Footnotes are very difficult for TTS.